NEW TRAIN. NEW JOURNEYS. NEW ADVENTURES. Open for sale Monday 3 December 2018. 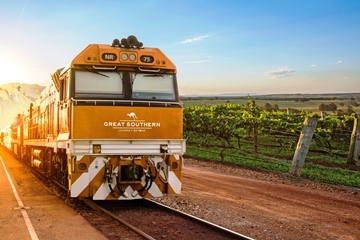 We are delighted to announce the launch of Great Southern, a new Australian rail adventure from the owners and operators of The Ghan and Indian Pacific. Great Southern will operate 16 departures between 6 December 2019 and 27 January 2020, embracing the wonders of Australia’s south-east corner with journeys from Adelaide to Brisbane and vice versa. Departing Fridays, the Adelaide-Brisbane journey includes touring in The Grampians, Canberra and a special beachside dining experience on the Northern NSW Coast. Departing Mondays, the Brisbane-Adelaide journey features a beachside dining experience on the Northern NSW Coast, as well as time spent in the stunning Hunter Valley wine region, regional Victoria and the incredible Twelve Apostles. Great Southern departures offer the choice of Platinum Service and Gold Service accommodation, with both options inclusive of dining, onboard beverages and Off Train Experiences. Terms and conditions apply. Advertised prices based on Advance purchase 3 day from Adelaide to Brisbane, other dates and routes prices will vary. Advance purchase fares are limited availability and subject to strict terms and conditions. Please speak to your travel consultant for further details. Advertised prices are based on payments with cash, payments with credit card will incur a surchage. For full terms and conditions please speak to your travel consultant for further details.